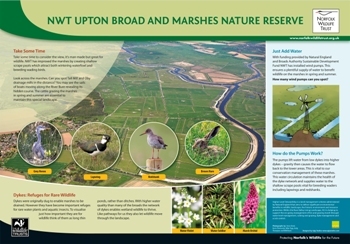 Ugly Studios were commissioned to design and supply new interpretation boards for Norfolk Wildlife Trust's (NWT) Upton Fen and Marshes Nature Reserve. In keeping with the NWT house style, the boards needing to be inspiring and informative for visitors about the landscape of the Fen. Working within the house style, we wanted to create a sense of the rich and evocative fenland landscape. We devised a colour palette and layout which would allow us to convey to the visitor the natural diversity and wealth of the fens and marshes. 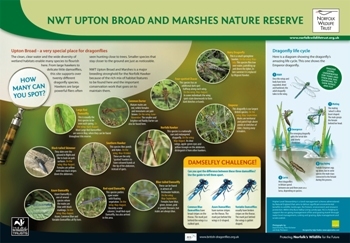 Alongside text and bespoke illustrations detailing walking routes and the wildlife of the area, we included information and graphics about its history, development, management and ongoing conservation work. 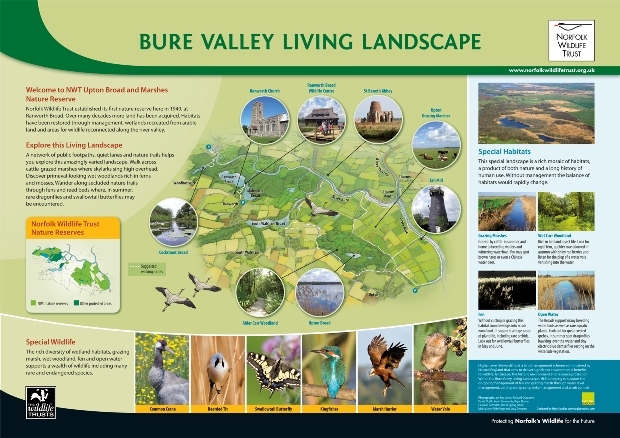 Additionally, we created illustrated ‘bird’s eye view’ maps of the landscape.